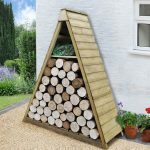 Log stores are an essential garden item if you’re one of the many people who are converting to log fuelled burners for your home energy supply. 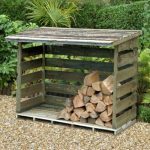 This is an excellent example of a log store, but it’s so much more than that as well, as it also incorporates a side compartment that can be used as a small tool shed for all your gardening essentials. This dual purpose also creates a unique, yet attractive, appearance. The left hand side is open fronted allowing easy access to logs and firewood and providing the ventilation that newly harvested logs need in order to dry out. The smaller right hand compartment is features a fully braced shiplap clad door with pad bolt. Shiplap cladding is also used on the pitched roof and the sides, giving good protection against the elements. 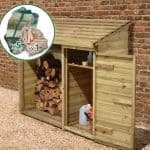 There are many value adding elements to this log store and shed, including a long 15 year warranty against the appearance of rot which can be provided thanks to the pressure treatment used on the timbers. 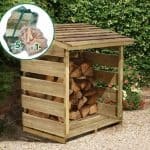 Another feature we welcomed was the inclusion of a free and generously stocked firewood pack, ready to use as soon as the store and shed is assembled. Although this compact garden building makes a very attractive whole, it really has two separate yet interjoined components. The first of these is the log store itself, and this has advantages over many that we review in that it has shiplap sides and roof. This provides added stability as well as giving extra weather protection. To the right of the log store is the tool shed. Whilst this certainly isn’t as tall or accommodating as stand alone tool sheds, it can still hold a good amount of small to medium sized tools. 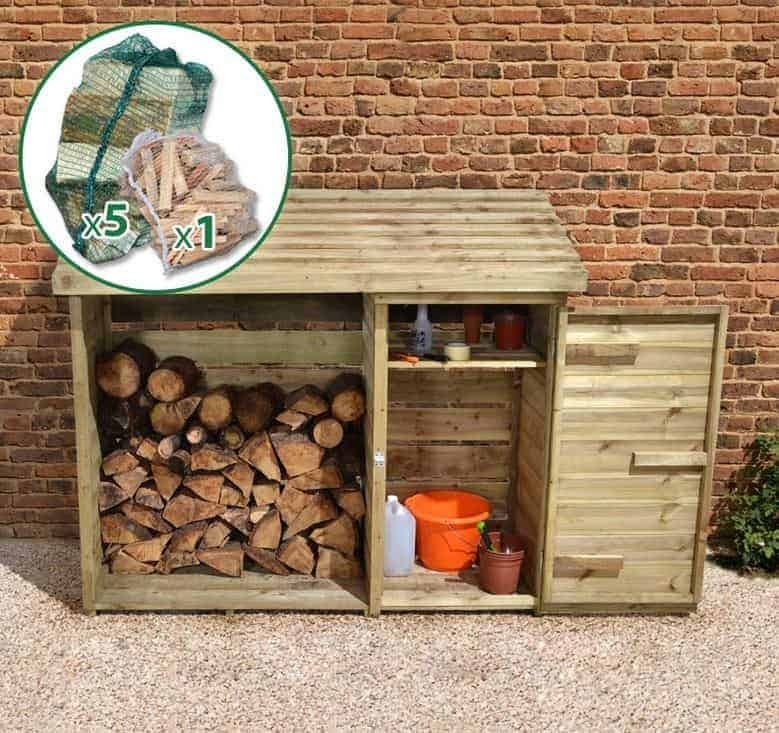 What we particularly liked about the tool shed is that towards the top it features a built in shelf, giving extra versatility and storage potential. We liked the overall appearance, and can see it becoming a talking point in gardens across the UK. 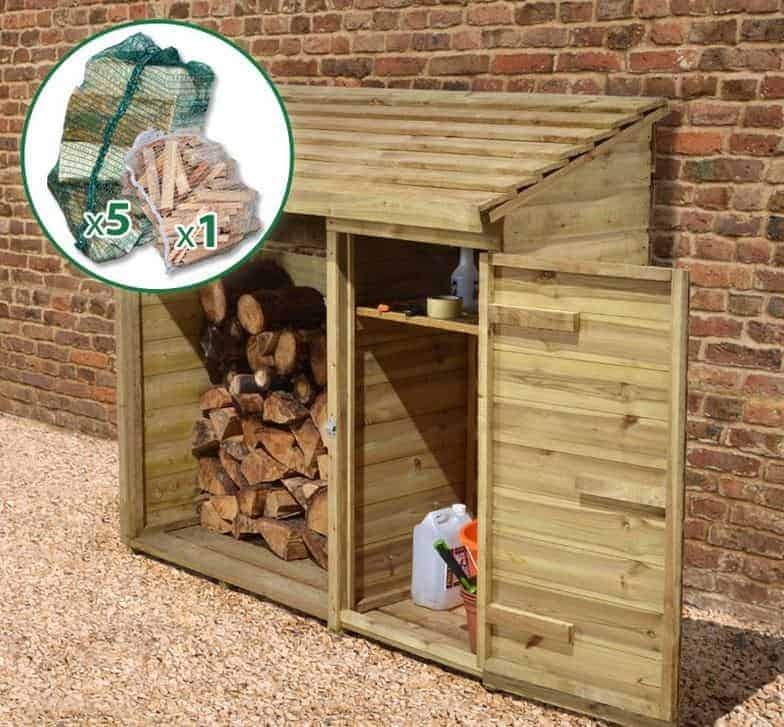 One thing that we did notice, however, is that it’s smaller than may log stores we see, with a ridge height of 1.46m and an eaves height of 1.23m. The overall width is 1.76m and the overall depth is 0.69m, but both of these include the overhang and the width measurement is for the combination of both elements. The tough cladding is, in our opinion, one of the stand out features of the shed. On the back it is open slatted to allow even more fresh air to flow through, but on the roof and side it’s arranged in a shiplap formation. It’s thickness of 12mm in both these areas matches that which we often see used on log store walls, and is in excess of that commonly used on their roofs. Square board of the same thickness was used for the floor, and this gives a solid and reliable surface on which to stack logs. We also appreciated the inclusion of four floor joists, as these raise the floor above ground level. That’s an essential feature for any wooden building, and yet it’s not one that we always find. 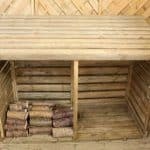 Every log store has to strike a balance between creating thorough ventilation and yet protecting the contents from rain and snow. We feel that this building keeps that balance well. The roof and side walls provide good protection, thanks to their shiplap cladding that channels water away, and by placing the open slatted back against, or near to, a wall there are three sides that don’t allow water in. 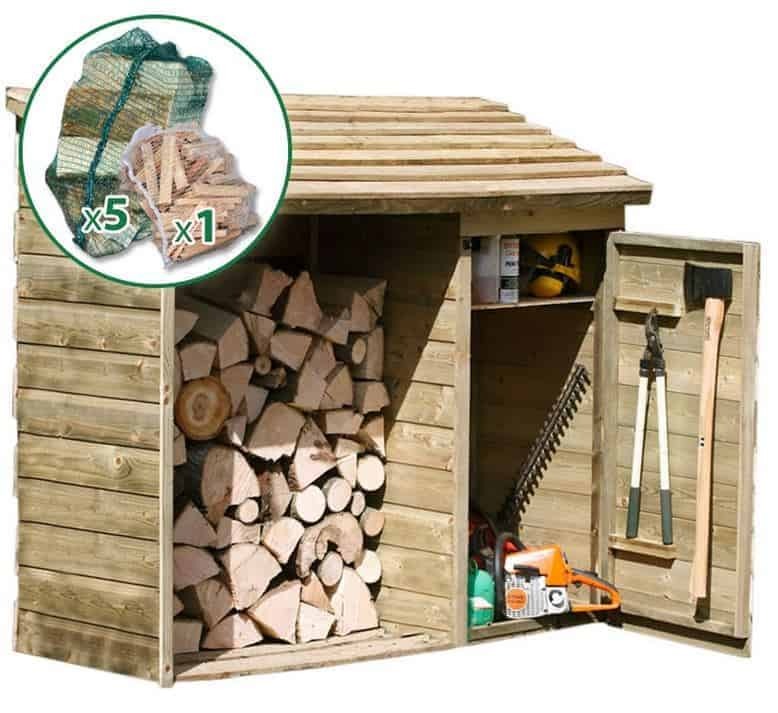 The tool shed features a shiplap style door that has a height of 1.13m and a width of 0.65m. This gives it good protection against the elements, although we would have also liked to see it given protection of another kind with the inclusion of a padlock. As it is, the door contains a bolt to which a padlock, which must be bought separately, can be added. It was very good to see that all timbers on this store and shed had been pressure treated, from the roof down to the floor joists. This gives it very long lasting protection against the threat of wet rot that all timber kept outside has to face. It also means that a 15 year warranty against rot is provided, which being as long as we see on the log stores we review is really appreciated. Treatment wise, we would recommend painting or staining the wood to protect it from the sun, and inspecting it every year to see if more wood preserver needs to be added to top up the protection. 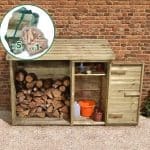 You won’t have to wait long to put the log store into action, as it comes with a free firewood pack. We were pleased to find that this pack was generous in its contents, containing five bags of logs as well as one bag of kindling. 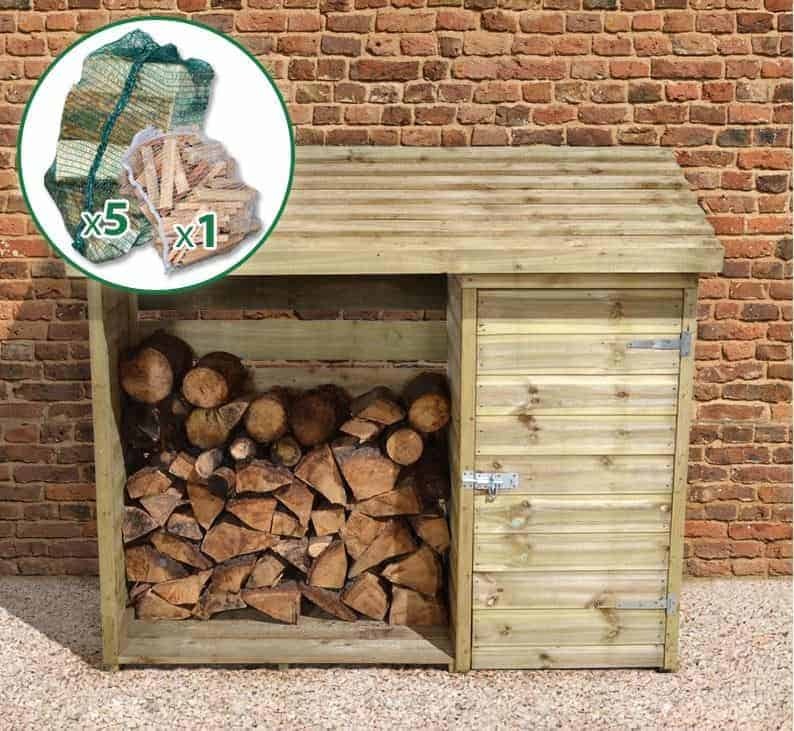 This is a plentiful supply that will keep a stove or fire burning for many days, and we feel that it adds real value to what is already a good value shed and log store combination. It was clear to see that the manufacture had placed a real emphasis on the quality of components, as shown by the use of pressure treatment to apply wood preserver. The cladding itself offers a good level of protection against rain, but this is enhanced by the aforesaid pressure treatment. 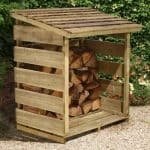 This is neither the tallest or widest log store we’ve reviewed, although it does have the tool storing ability that other stores don’t. The instructions are very clear and straightforward. Read them carefully before commencing, and you should then be able to complete the installation in around two hours. 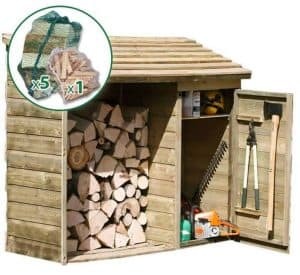 This log store suffers in relation to others because of its size, but it gains value thanks to the tool shed element and the free pack of logs and kindling. 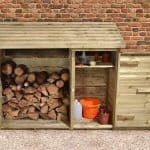 Final Thoughts: We really liked the fact that this small garden building contains both a log store and a tool shed, as we think this doubles its value and functionality. We can easily imagine tools such as a saw or axe being kept in the tool section which could then be used on logs and wood stored in the neighbouring section. The structure as a whole is well constructed, and thanks to the use of pressure treatment it should stay looking good and performing well for many years to come. The only additions we would make are the purchase of a padlock and the use of a stain or paint, but these needn’t be expensive purchases.